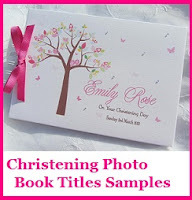 Sending thank you messages to guests after a christening or baptism ceremony is really thoughtful gesture and you must thank your friends and relatives for their time, effort and christening gifts. 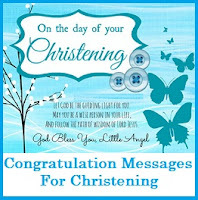 Here is an excellent collection of sample thank you messages for attending christening ceremony that you can use. 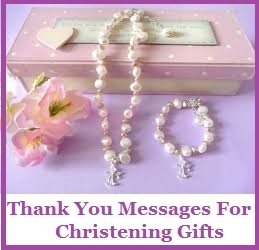 Also check our amazing collection on thank you messages for Christening Gifts. Your presence in Adams baptism is deeply appreciated. Thank you for taking time to attend the ceremony. Thank you for sharing this joyful occasion with us. We truly appreciate your time and support for coming and blessing our family. Bob and I would like to thank you for your attendance during the baptism of Matthew. It was a pleasure seeing you again. Our friendship bond is stronger with kids now. Our hearts are filled with joy with the christening of Sandra. Thank you for being part of it. Your presence during the baptism of Lilly will always be remembered. Thank you for taking time to come and celebrate the occasion with us. 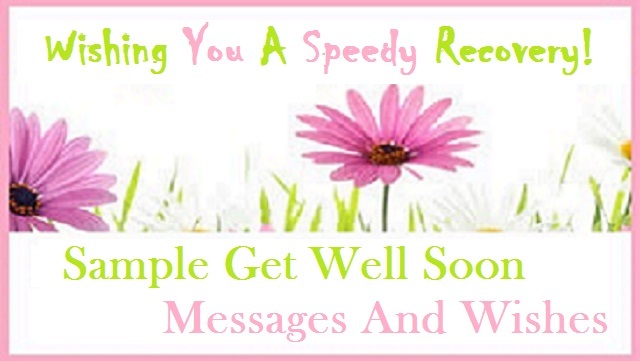 Just dropping by to again express our thanks for your attendance during Marks baptism. Your presence was a blessing to us. You always bring sunshine wherever you go, that’s why I knew I made the right choice when I invited you to Rachels christening. Thank you so much for coming. 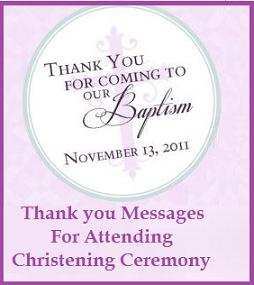 From the bottom of our hearts, we express our gratitude for your attendance during the christening of our child. May we meet each other again soon on other family occasions. Your presence during the baptism of our baby added more joy to the occasion. Thank you very much. Thank you for spending some time with us during Amanda's christening. You are truly a blessing to the family. In your own special way, you have made your presence felt during Sarah's baptism. Even though you were not physically there, we truly appreciate your taking time to be part of the ceremony via streaming. Thank you for coming to Andy's baptism. Your presence made the day special. Our sincerest thanks we bring. Your presence in Lotty's christening meant so much to our family. Your presence during Zoe's baptism strengthened our bond as friends. I am forever grateful that you came and became my baby’s godparent. The weather was never a hindrance to your attendance to Lolitas christening. Thank you very much for being there despite the storm. 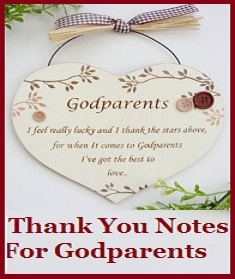 Our sincere thanks to you for coming to Nathens baptism. 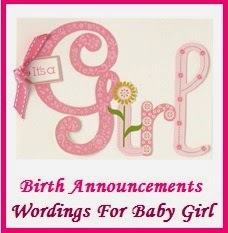 We are truly blessed with your coming. 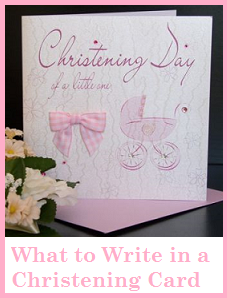 Your presence during Allisters christening made the day truly special. It wouldn’t have been the same without you. Special occasions like these bring family and friends closer together. Thank you for coming to Harrys baptismal celebration. Despite the odds you were able to attend our sons christening. We are truly touched by your presence as you celebrated this very special day with us. No words can express how very thankful we are for you attendance during Mollys baptismal day. We really appreciate your coming. 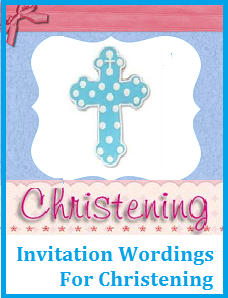 Thank you for attending Ria's christening day. Your presence was a blessing not only for the child but also for the whole family. We are thankful that you came to the baptismal celebration of Lotty. We will cherish this day. 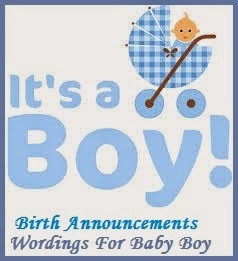 In behalf of our son/daughter and the whole family, we thank you for your presence during the christening ceremony. Blessings upon you as you made Andy's baptismal day extra special with you presence. Thank you.